Ham Radio soundcard digital mode operation is a lot of fun and a way of life (ham life at least) for me and many others. It may not be as popular as phone operation or even CW but there are quite a few hams who primarily hang out on digital modes as their primary way of communicating on the ham bands. However, like most fun things (and many that aren't) soundcard digi operation can sometimes be frustrating, challenging, and annoying. Sometimes it might be the band conditions, weather problems, equipment behavior, or a host of other things. Sometimes it is the software. Software can often have bugs, lack of features, poorly implemented features, too many features, and a boat load of other things that can rain on some peoples parades. Some software is non-intuitive and makes one wonder if the creator had hung out with the Jefferson Airplane in the 1960's too much and inhaled too deeply. And some of it is pretty darn good and intuitive - or at least as much as it can be with so many choices and digital modes. FLdigi is a great program! I think it is put together well and most of it's features implemented in a logical and easy to use way for a program of it's scope. Dave, W1HKJ the creator, and others have turned it into a fantastic program and done a great service to the soundcard digital community and beyond. But ... There are always going to be hams who have different opinions and those who think that some or many things in FLDigi (or any piece of software) ought to be implemented in other ways, or need more features, or needs less, or etc., etc. Isn't Open Souce code the greatest thing since sliced bread? I admit that I would change 99% of all software I have used IF I could. That doesn't necessarily mean there is anything wrong with the software or for that fact anything wrong with myself (the jury is still out on that). However, I admit that I like things MY way. Both McDonalds hamburger chain AND programs that use Open Source code understand that. Now, that is not the only reason for Open Source code and maybe not even the main reason BUT it's certainly one that is important to many of us hams. So that is why I made a custom version of FLDigi - called FLDigiRol - to more suit myself. I made it for myself. I put it on my web page for anyone else who might be interested BUT I make it the way I want it. I don't mind getting suggestions, opinions, or an occasional question or two but I do NOT support it in the same way that the original FLDigi program is supported by W1HIJ and others. And THEY do NOT support my custom version either. I operate Olivia and Contestia modes 95% of the time as is noted by all the other pages here at oliviamode.com. So, I made FLDigiRol a little more friendly for Olivia and Contestia users than the original version is. I added a control window (as shown in the graphic at the top of the page) that presides at the bottom of the FLDigiRol main window. It has 27 programmable buttons that can be set to most of the available modes and configurations of modes that the program has. The programmable buttons can be programmed by right clicking on one of the buttons. This will bring up a dialog box with many modes to select from. The buttons can be re-programmed at any time. It does NOT support multiple buttons with the same mode and will not permit that. Below the programmable buttons there are some other controls. These controls allow the user to quickly change the important setting of Olivia and Contestia without having to go to the Modems dialog page to do the same thing. It also allows the user to quickly change to any of the 40 different Olivia and 40 different Contestia configurations that are available. 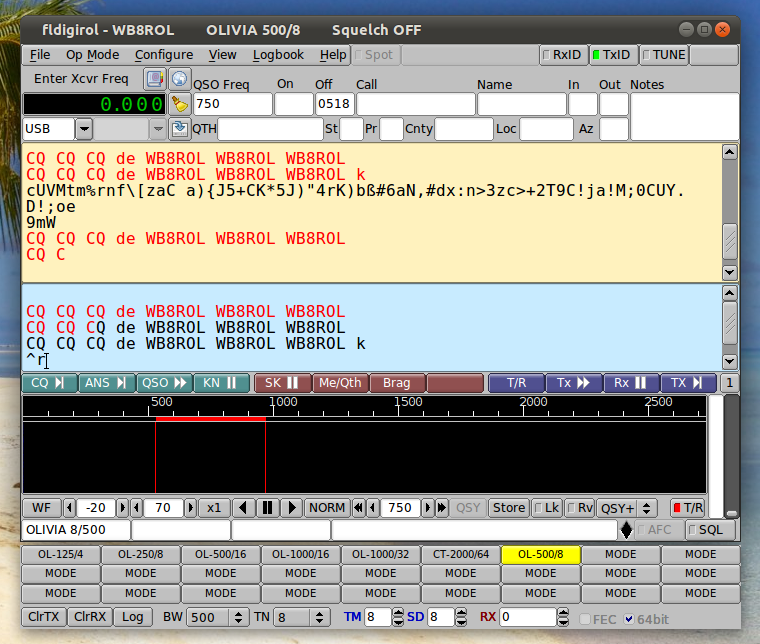 The bandwith has 5 different settings and the tones have 8 different ones : 8x5 = 40 ways to configure Olivia or Contestia. These settings should only be set while in receive mode. The Synch Depth (Integration Period) and the Tune Margin settings can also be set without having to go to the modem settings. There are also (as shown in the above graphic) a couple of settings for OTHER modes as well. The FEC can be enabled or disabled for DominoEX modes and the 64bit setting for MT63 can be enabled or disabled (which will set it at 32bit). There are other differences in my version of fldigi also and eventually I will have all those listed. This is still a work in progress (this documentation too). BandInfo is a small simple utility client (for the Flex 6300) that will display information about the current band - determined from the frequency of the currently active slice. It is a single rectangular window with NO titlebar. It can be moved by just clicking on it and holding down on the left mouse button and dragging it. It is closed by double-clicking on it with the RIGHT mouse button. It will remember it's position after it is closed and restarted. I made the window short in height so that I could position it right over the titlebar on SmartSDR. BandInfo will stay on top if it is positioned over SmartSDR. It may or may not work for the Flex 6500 or 6700. It has been tested on several 6300 rigs. BandInfo is DonateWare. If you try it and find it useful then I would appreciate any donation of any amount through the button below that takes PayPal and any of the credit cards listed below the button. This download had NO time limit, nag screens, or other annoying reminders. It is the full and only version of BandInfo.